Restaurants have a high risk of fire due to their open flames, hot equipment, cooking oils, electrical connections and paper products. A fire can destroy a restaurant, causing lost revenues and possibly permanent closure. Fire prevention and protection are critical to keep your business safe. Here are a few restaurant fire safety tips to prevent fires and minimize the damage. Install an automatic fire-suppression system in the kitchen. It will automatically dispense chemicals to suppress the flames and shut down the fuel or electric supply to other cooking equipment in the kitchen. 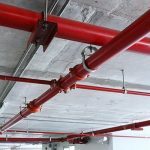 The fire-suppression system should be professionally inspected twice a year. This is essential because most restaurant fires start in the kitchen. Have a portable fire extinguisher for an alternative. Class K extinguishers should be in the kitchen for fires involving grease, oils, and fats. It should be used after the activation of the built-in hood suppression system. For other areas of the restaurant Class ABC extinguishers should be used for fires involving paper, wood, plastic or electrical. Schedule regular inspections and maintenance on equipment. Electrical equipment should be inspected for frayed cords or wiring, cracked or broken switch plates and fire hazards close to power sources. Exhaust systems require regular inspections for grease buildup. Wood or charcoal burning ovens should be inspected monthly. Train your employees on fire prevention to learn how to prevent a fire from happening. Everyone should learn how to use a fire extinguisher and how to store flammable liquids properly. Show them where the fire alarms are located and practice fire drills using different emergency exit routes. 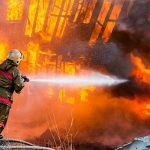 Protecting customers, employees, equipment, and property from fires is important to all restaurant owners. Following these restaurant fire safety tips will minimize your fire risks. Call Fire Control Systems to help you with all your restaurant fire safety needs.